Cell Death Dis 2011 2, e243. Nutlin-3 purchased from Selleck. Cell Death Dis 2012 3, e294. Nutlin-3 purchased from Selleck. J Cell Physiol, 2018, 233(9):7424-7434. Nutlin-3 purchased from Selleck. Ubiquitination of p53 in vivo by BIRC6 in the presence of Nutlin-3. Cells were treated with Nutlin-3 (20 uM, 24 h) before harvest. Cell lysates were immunoprecipitated with anti-p53 antibody and immunoblotted by anti-ubiquitin antibody. Int J Oncol 2014 44, 761-8. Nutlin-3 purchased from Selleck. Med Oncol, 2016, 33(10):113. Nutlin-3 purchased from Selleck. Vassilev LT, et al. Science, 2004, 303(5659), 844-848. Thompson T, et al. J Biol Chem, 2004, 279(51), 53015-53022. Laurie NA, et al. Nature, 2006, 444(7115), 61-66. Lau LM, et al. Oncogene, 2008, 27(7), 997-1003. 宮崎, 理樹. 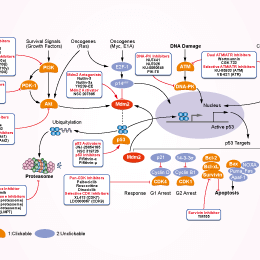 Study on p53-MDM2 Interaction Inhibitors as a Novel Anticancer Agent. 2013, Hokkaido University. Is this a racemic mixture of Nutlin-3a and Nutlin-3b or just the Nutlin-3a enantiomer?